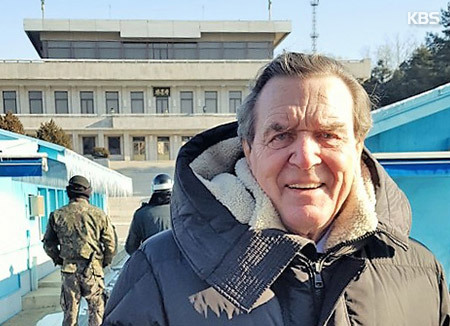 Former German Chancellor Gerhard Schroeder has emphasized the importance of cooperation in bringing permanent peace to the Korean Peninsula. Attending a forum at Seoul City Hall to discuss inter-Korean exchange and cooperation on Wednesday, Schroeder said it will be a long, winding road before the Korean Peninsula finally becomes peaceful. He said many stumbling blocks and difficulties lie ahead and everyone should be united and cooperate with each other in overcoming them. Schroeder, however, praised the two Koreas for beginning the journey on the path, saying hitting the road is as significant as reaching the destination.